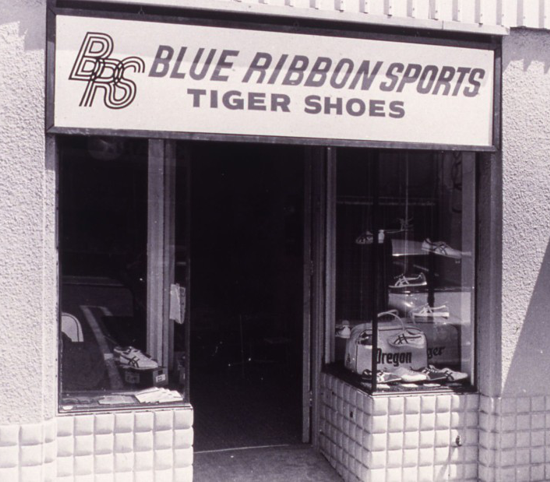 Features: The company was founded on January 25, 1964 as "Blue Ribbon Sports" (BRS) by University of Oregon track athlete Philip Knight and his coach Bill Bowerman; it initially operated as a distributor for the Japanese shoemaker Onitsuka Tiger (now known as Asics). In 1966, BRS opened its first retail store, located in Santa Monica, California. In 1967, due to rapidly increasing sales, BRS expanded retail and distribution operations on the East Coast, in Wellesley, Massachusetts. By 1971, the relationship between BRS and Onitsuka Tiger was nearing an end, and the company changed to Nike Inc. In 1972, the first line of Nike footwear is introduced, including the so-called "Moon Shoes" and the Nike "Cortez", that became the company's most popular product. 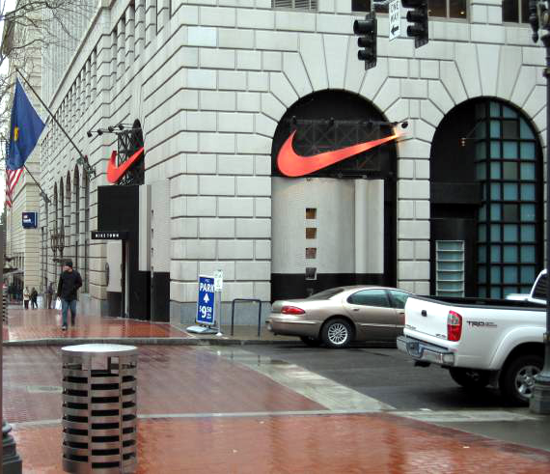 The first Nike retail store opened on November 21, 1990, at the corner of Southwest Sixth Avenue and Salmon Street in Downtown Portland, the city center of Portland, Oregon, United States. Interesting facts: The company takes its name from Nike, the Greek goddess of victory. 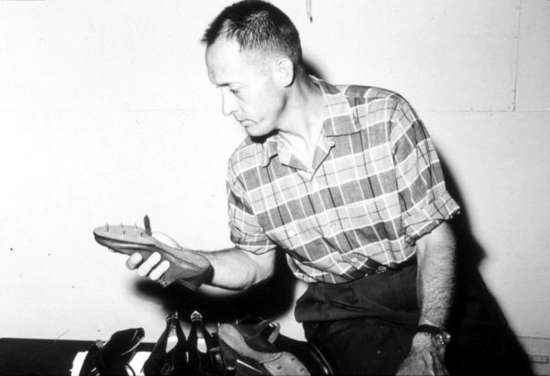 In 1971 the co-founder Bill Bowerman used his wife's waffle iron to create a new sole for footwear that would grip but be lightweight. 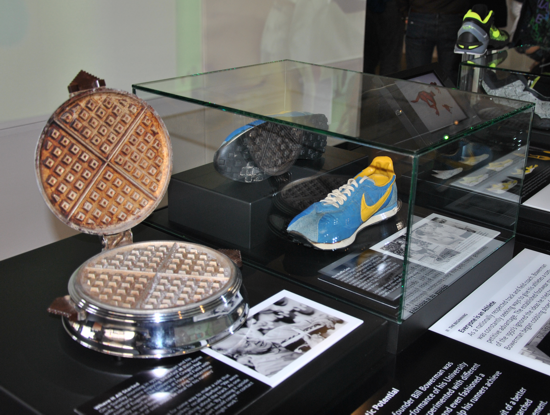 The shoes was named "Moon Shoes" because of the resemblance of the waffle-patterned tread to footprints left by astronauts on the Moon. Nike origins: the first Blue Ribbon Sports (BRS) retail store opened in 1966 at 3107 Pico Boulevard in Santa Monica, California. The store distributed Onitsuka Tiger shoes. 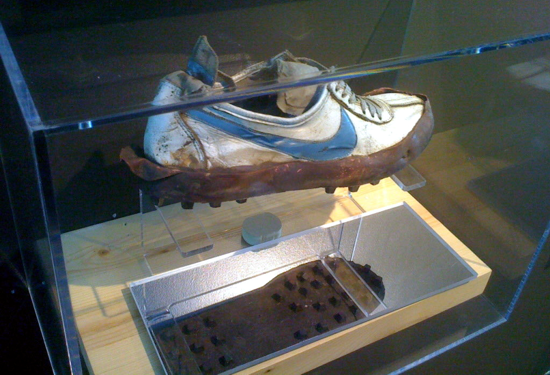 Rare Nike handmade "waffle" prototype shoes by Bill Bowerman. Jordan Geller, who owns hundreds of original Nike shoes housed in his ShoeZeum in California, bought these shoes in 2014 for $1,500 from an Oregon man, Jeff Wasson. Jeff says he was given the shoe in 2010 by Tom Bowerman, one of the sons of Nike co-founder Bill Bowerman. 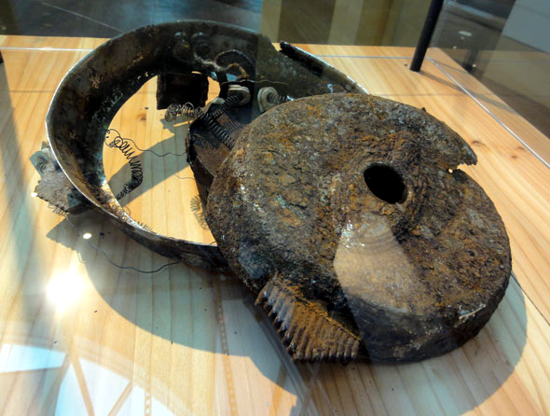 The original waffle iron that inspired Bill Bowerman to create Nike's "waffle" sole, and one of the shoes unearthed in a rubbish pit on Nike co-founder Bill Bowerman's property, on display at company headquarters near Beaverton. Nike Moon Shoes (1972). 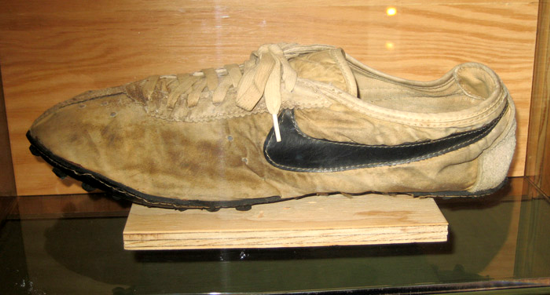 Nike handed out this shoe to athletes competing at the U.S. Olympic Trials Eugene, Oregon, 1972. The sole was designed to minimize its weight, maximize traction, and prevent blisters. 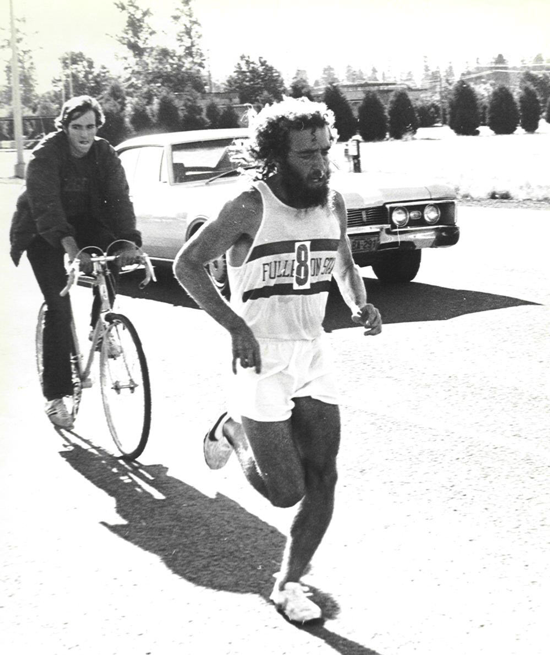 The American runner Mark Covert wearing Nike shoes (1972). Mark Covert, placed seventh in the 1972 U.S. Olympic Trials Marathon in Eugene, Oregon, became the first person to cross a finish line wearing a pair of Nike shoes. Nike "Swoosh" logo was designed by Carolyn Davidson while a graphic design student at Portland State University in Portland, Oregon. For her services, the company paid her $35 ($206 in 2015 dollars). The Swoosh was first used by Nike on June 18, 1971, and was registered with the U.S. Patent Office on January 22, 1974. 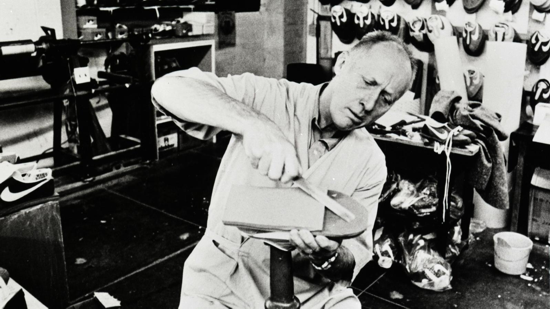 William Jay "Bill" Bowerman (Portland, Feb. 19, 1911 - Fossil, Dec. 24, 1999), American track and field coach, designer of the first Nike shoes and co-founder of Nike Inc. with Philip Knight. 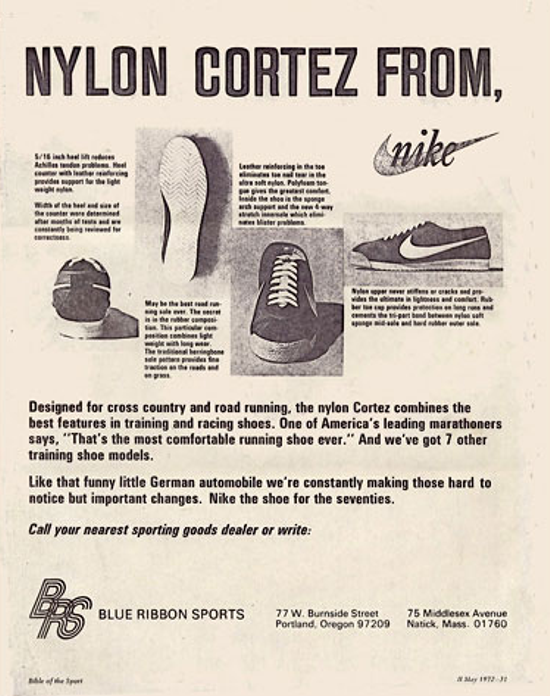 Nike Cortez advertising (May 1972). Originally designed in the mid-sixties by Bill Bowerman, an early 1967 catalog described the Cortez as «Designed to be the finest long distance shoe in the world. Soft sponge midsole through ball and heel absorbs road shock; high-density outer sole for extra miles of wear». 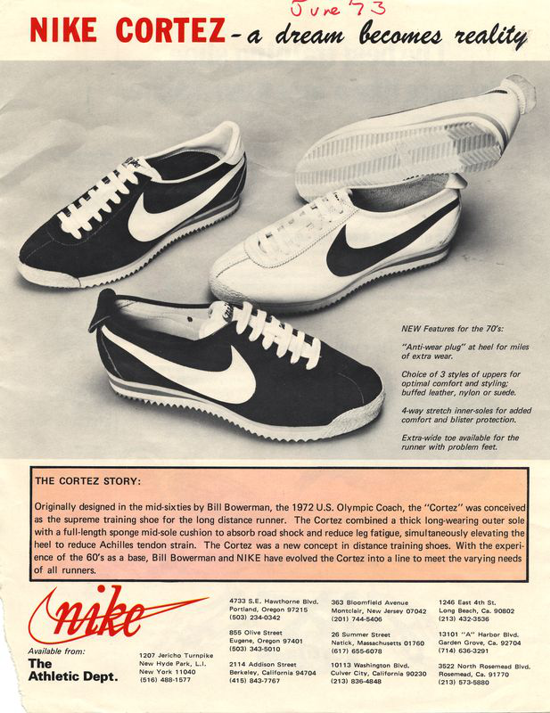 Nike Cortez advertising (June 1973). When Philip Knight and Bill Bowerman ceased importing and distributing running shoes through Blue Ribbon Sports and launched Nike as a designer and maker of athletic shoes, the Cortez silhouette carried over to the new brand. Nike, the first retail store opened on November 21, 1990, at the corner of Southwest Sixth Avenue and Salmon Street in Downtown Portland, Oregon, United States. Nike Cortez, the iconic shoe designed by Bill Bowerman at the end of the sixties and released in 1972, returns in its original colorway - as seen in the cult movie "Forrest Gump" - to celebrate 43th anniversary (2015).